How does NOAA's P3 Orion safely navigate hurricanes? It's the only plane actually in Hurricane Matthew. What I'm curious about is how they get through there safely? I know they have done it with prior hurricanes, and I assume they have some sort of weather radar on board (being a NOAA aircraft and all), but I also assume there is much more to why that P3 is able to make it through a Hurricane without breaking apart. Anyone have some insights into what makes this possible? I'm especially curious about what they do to avoid the worst pockets of the storm (assuming they do). Clearly there's not that much weather to avoid in the eye of the hurricane, but getting through those walls has got be pretty difficult considering all the wind shear. The National Oceanic and Atmospheric Administration uses three aircraft for carrying out hurricane research- a Gulfstream IV SP and two Lockheed Martin WP-3D Orions, while the USAF 53rd WRS 'Hurricane Hunters' uses the WC-130J for this purpose. Of these only the latter ones are used for penetration purposes. 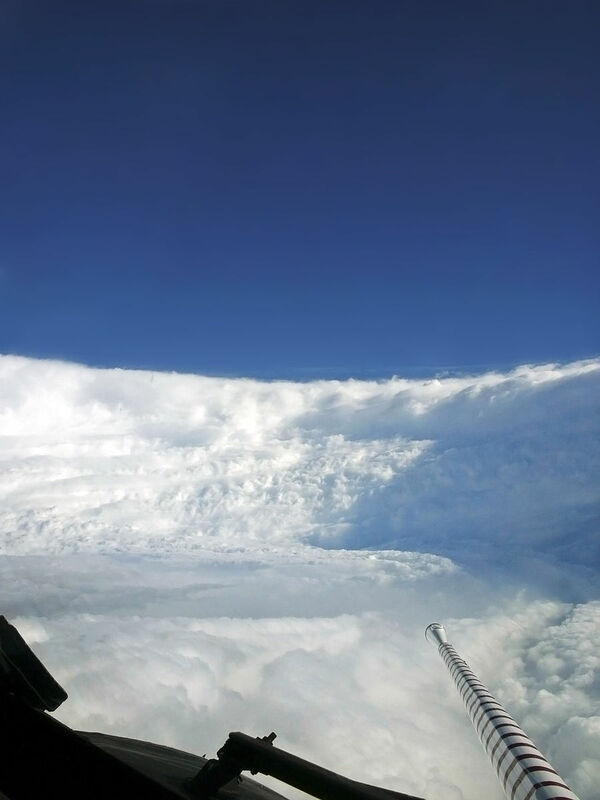 The NOAA G-IV jet usually does NOT penetrate the hurricane eye, but is assigned to fly synoptic scale patterns AROUND the storm, deploying dropsondes along the way, in order to profile the environmental flow that is moving the hurricane. Each WP-3D aircraft has three radars: nose, lower fuselage and tail. The nose radar (a solid-state C-band radar with a 5° circular beam) is used strictly for flight safety and is not recorded for research purposes. During the most dynamic portion of the flight, Price is in constant communication with the Flight Director, who provides real-time flight guidance based on the radar picture. ... airplanes are built to go very fast through the air, and they don't care if the wind is 5 knots (nautical miles per hour) or 150 knots! .... Although there are usually some bumps on the way through, they are nothing that the airplane can't handle.. The WP-3D is built like a tough old pickup truck. It can handle a lot of abuse in the storm environment and come back and fly the next day. ... hurricane's rainbands and the eyewall, which can get a bit turbulent. The eyewall is a donut-like ring of thunderstorms that surround the calm eye. The winds within the eyeall can reach as much as 200 mph [325 km/hr] at the flight level, but you can't feel these aboard the plane. ... the turbulent updrafts and downdrafts that one hits. Those flying in the plane definitely feel these wind currents. These vertical winds may reach up to 50 mph either up or down, but are actually much weaker in general than what one would encounter flying through a continental supercell thunderstorm. Depending on how strong the winds are you have to point the nose of the aircraft so that your track will lead you into the eye. The difference between heading and track is known as your drift angle. Sometimes you can have as much as 20-25 degrees of drift angle. We sometimes call this “crabbing” into the storm, where we are pointing the aircraft to the left or right to flight straight. The image below shows the path taken by one of the aircraft during flight into Hurricane Hugo. Not the answer you're looking for? Browse other questions tagged aircraft-design safety weather or ask your own question. How did this air force plane likely get into the eye of Hurricane Florence? 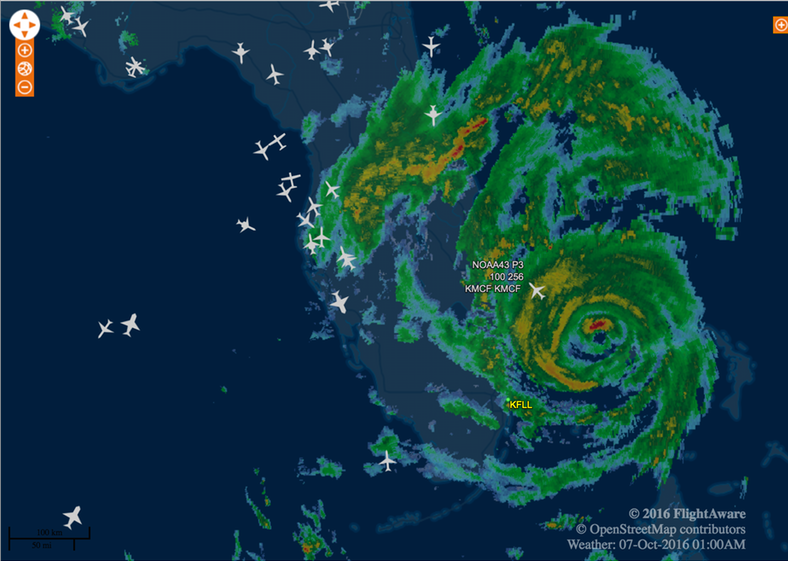 Do airlines continue operating in the vicinity of a hurricane? What in-flight weather info is available to commercial pilots? Can commercial airliners fly over hurricanes? Are solar / geomagnetic storms real risks for commercial aviation? When do pilots facing bad weather turn back (U-turn)? Did AF447 cross dangerous weather? When is a high pressure system associated with IFR/MVFR conditions?